PORT VILA, Vanuatu, Nov 22 2017 (IPS) - It’s been dry in Isavai on the island of Aniwa for last couple of years – ever since Tropical Cyclone Pam tore through Vanuatu in March 2015, leaving an El Nino-induced drought in its wake. A dry phase is bad news for farmers anywhere, but in Aniwa, where there is no constant water source and the only water supply comes almost exclusively from harvesting rain into tanks, it’s disastrous. Without water, crops can’t be irrigated. Without irrigation, crops are much more likely to fail. And when crops fail, food becomes more scarce, nutrition decreases, and health declines. To combat this cycle, communities across Tanna, Erromango and Aniwa – including Isavai – are adapting to the impacts of droughts, disasters and other climate shocks by diversifying their crops and improving farming techniques to increase food security. For Kalgy, an agriculture teacher in Isavai, these are projects close to his heart. He has been working with students at the Irumori Primary School in Isavai to share his knowledge about farming using a teacher’s garden, a long walk away from the classrooms. The garden lies in full sun. It has rained only once since he planted it and there hasn’t been enough water for watering the seedlings. Adopting climate resilient agriculture techniques is difficult. Education is critical. 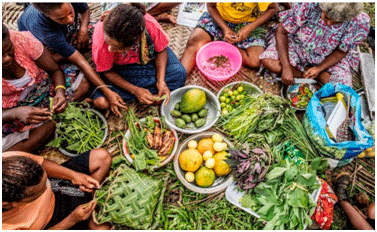 Together with partners, CARE International has introduced 10 communities in Taffeta province in southern Vanuatu to a range of new agricultural methods by establishing demonstration gardens. The communities provide lots of land, either in schools or elsewhere within the community, and agriculture ministries provide a range of hybrid plants, which have been especially produced to require minimal water to flourish, and CARE provides seeds for a range of vegetables, most of which are varieties that are not currently grown in the community’s gardens. Over two days of training in each community, citizens work together to clear the land and build fences using the timber removed from the plots, or other locally sourced materials, then plant the plants and seeds. The demonstration gardens include a nursery for small seedlings, made from layers of readily available coconut husks, and an array of vegetables, including yam, taro, kumala, cabbage, beans, tomato and lettuce. Providing a wide assortment of varieties enables the community to experiment to see which will survive and thrive in their area. Once the crops have been harvested, community members are able to use seedlings, root stock and grafts from the successful varieties to diversify their own gardens. In Isavai, one of the demonstration gardens is inside the school boundary and students as well as teachers, members of the school committee and the wider community helped to build it. The experience has been eye opening for many, especially the students. According to Kalgy, the students are now leading the way in putting their new skills into action – ensuring their climate-responsive knowledge will impact the community far beyond today.